Excavation photographs: Park of Tongland excavation. The remains of a stone listed as a 'four-poster' by H A W Burl (Information contained in letter to OS 24 November 1970), stand c. 300' OD on the ridge of Tongland Hill, about 200 yards W of Park. As they stood in 1911, there were three stones erect forming an equilateral triangle with each side c. 16' long. The most northerly of these has been re-erected since Coles' survey, when it was prostrate in front of where it stands. The W stone is 3'5" high and 5' 4" in circumference, the E is 3' 2" high and 6' 1" in circumference, while the re-erected stone, a similar boulder, is 3' high and 6' in circumference. Coles also marks on his plan a number of stones just below the turf, but the RCAHMS considers that none which they saw could be regarded as indubitably connected with the circle. Near the centre is an oblong excavation but no sign of a cist. F R Coles 1895; RCAHMS 1914, visited 1911. Remains of stone circle. The three standing stones are as described. There is no trace of cairn or any evidence to suggest that these are the surviving stones of a stone circle or a four poster. 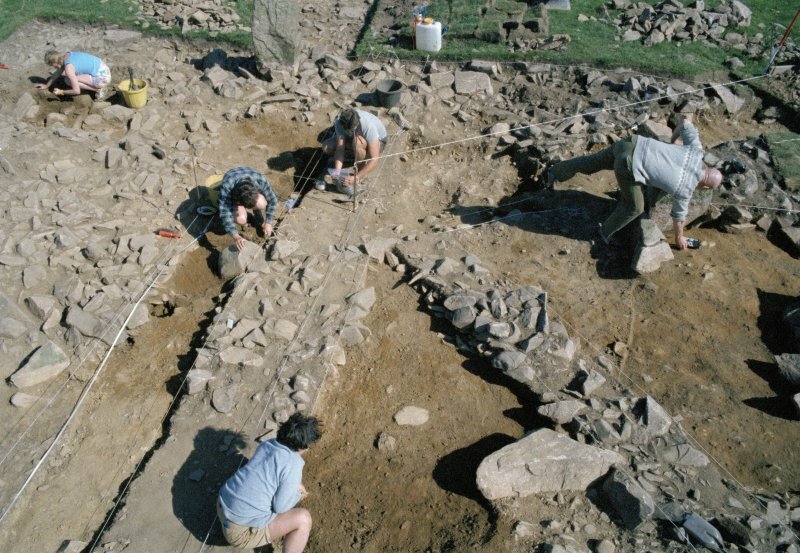 In response to the collapse of one of 3 extant standing stones, excavation has shown that the site consists of an oval cairn within which the standing stones are set. The stump of a fourth upright was discovered within the cairn. Beneath the cairn a small cremation cemetery was uncovered; finds include a collared urn, a possible cordoned urn and an accessory cup. C-14 dates will be forthcoming from sealed sub-cairn contexts.